In the early 1950s, a trend began that would continue until the arrival of battery powered quartz movements in the early 1970s. Wristwatch movements had increased in quality since the World War I era, largely because of advances made in machine tooling and the ability to manufacture components more precisely than had previously been possible. All the major Swiss houses saw the commercial potential of offering extremely accurate chronometer rated models and focussed their production and advertising in this area. Some of the most exceptional mechanical movements that have ever been made were manufactured during this golden age and it has often been suggested that the outstanding quality level that was achieved by the top tier houses at this time will almost certainly never be equally again. In time, one of the things that we intend to add to this site is a reference section that will include a lot of period advertising that we have accumulated here from the last nine decades. Wristwatch design has always responded to social changes, but it is especially fascinating to compare adverts from Rolex, Omega, Jaeger LeCoultre and the rest from the 1950s with those published in the last ten years. Today, at a time when we’ve become obsessed with the concept of the celebrity, luxury watch advertising typically focuses on which well known personality from the world of sport, popular music or entertainment happens to be wearing the watch of the company concerned. There isn’t any real substance to these glitzy adverts and hardly ever, if at all, is reference to technical specification and accuracy results mentioned. Study an advert from the 1950s and you’re very likely to be confronted with images of scientists and engineers, these serious professions having enjoyed far more status with the public than they sadly do today. The results achieved in chronometer tests and independent accuracy trials were proudly trumpeted, with additional text attempting to explain any innovative technology that had been used on a particular model. This was the age of clearly defined, substantiated claims within the Swiss luxury watch industry. The buyer of a high grade, expensive watch would make a decision as to what he bought based on which watch was the technically superior and best built product, not because his favourite film star or golf celebrity had been photographed in the same model. Again, it is very noticeable how at this time, the major houses would often include small booklets with each new watch sold explaining aspects of its movement design and regulation that were likely to be of interest to the purchaser. Now and again, in our business we’re lucky enough to stumble across examples that still retain these tags and booklets, and though they push up the price of a watch as it would have been without them, they’re very much collectors’ items in their own right and charming things to own. A number of famous models made their debuts in the 1950s. Omega launched its flagship model, the chronometer rated Constellation, in 1952. All well preserved vintage Omega Constellations are delightful watches that ooze quality and aesthetic charm, but there is something about the first incarnation, with Omega’s in-house built calibre 354 bumper movement, that is especially irresistible, representing as it does the start of a bloodline that still continues today. Breitling released its Navitimer, reference 806, also in 1952, an oversized model that was intended as a navigational aid ( the model name is a contraction of “Navigation Timer”). Technically, it wasn’t actually a completely new idea, its distinctive slide rule bezel having been first seen on the Breitling Chronomat ten years earlier, but certainly, the Navitimer has achieved cult status today as one of the vintage wristwatch world’s all time classic models. Very early, first generation, Breitling Navitimers are difficult to find in unrestored, investment grade condition, but we always try to have at least one example for sale on this site, with greater numbers of the iconic second state 806 offered in the 1960s being available. The Breitling Navitimer was a member of a new category of models known today as “tool watches”, this term being derived from the fact that they were designed from the outset as working tools for specific applications. The Navitimer was intended for use by pilots, the Rolex Submariner by divers, the Rolex Milgauss and IWC Ingenieur for those working in areas of high magnetic field and the Rolex GMT-Master was created in conjunction with airline pilots working for Pan-Am as an aid in keeping track of time while flying long haul through several time zones. Before the 1950s, there hadn’t really been the concept of a watch designed for a particular occupation or lifestyle and the launch of these models was an important development that would lead the way for a succession of similar themed variants in future decades. It is also interesting to look at brand dominance during the 1950s. Today, we see Rolex as being the most prominent luxury watch brand, and over eighty percent of the movements that are sent annually for independent assessment as chronometers at the Swiss observatories are of Rolex origin. A combination of superb advertising and continual, but gradual, product development has led to a position when Rolex now exerts a vice-like grip over the marketplace. This wasn’t always the case by any means and if we look at the fascinating tables reproduced as part of Fritz von Osterhausen’s excellent 1997 book “Wristwatch Chronometers, Mechanical Precision Watches and Their Testing” we can see that for most of the 1950s ( and all of the 1960s), Omega consistently produced more chronometer grade wristwatches than Rolex. After a series of very successful publicity campaigns orchestrated by the firm’s advertising agent J. Walter Thompson, Rolex achieved parity with Omega in 1969 and from then on continued to steadily press ahead to its current dominant position. The fact remains that for most of the 1950s and ‘60s, the general public at large regarded Omega as a “better” watch than Rolex. Unquestionably, the quality of movements used by the two houses was equal in every way with neither being superior to the other, which rather makes good, original vintage Omega pieces from this period seem to offer superb value for money compared to their pricier Rolex equivalents. 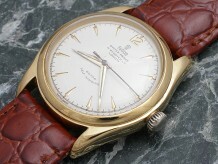 A near mint automatic Rolex Tudor Oyster Prince 34 with the highly desirable 390 movement. Good, untouched Tudor Oyster Princes from the early 1950s are very challenging to source now. This is among the best we’ve owned in several years. While a very attractive watch, the appeal of this piece to the vintage IWC collector lies in its calibre 62 movement. Only produced for 11 years, including World War II, this beautiful mechanism is not often seen and is rightly regarded as an exotic find. Historically important piece as it contains the first automatic movement type, calibre 138, to be produced by Universal. Manufactured entirely in-house, the quality of these early self-winding Universal mechanisms is second to none. An immaculate example of the rare and desirable Rolex Tudor reference 1431. This was a perpetual model, but curiously, not an Oyster. With the celebrated calibre 390 movement and a large case, it is one of the most beautiful of all the Tudor variants. Very collectible in this condition. Simple and very elegant, this classic Rolex Tudor offers a very affordable entry into the world of vintage luxury wristwatches. Authentic and correct throughout, it is an attractive Rolex watch that can be bought for a modest sum. This ingenious model offers the facility of storage behind the case back, accessed by pivoting the watch front upwards. Retailed by high society New York jeweller Tiffany & Co, it is the perfect quirky luxury watch of its era. Eberhard is one of the most technically interesting of all the vintage watch brands and the quality of its work is marvellous. This example is fascinating because of its case construction, which we have never seen before. A rare item. With its distinctive early wide lugged case and bumper self-winding movement, this is the classic first generation vintage Omega Seamaster. This model represents the birth of an Omega range that is world famous today. Arguably inspired by speed record breaker Sir Malcolm Campbell, the Speedking remains one of the essential vintage Rolex Oyster variants. This example combines the glamour of the Speedking with a rare Rolex Super Oyster winding crown. This is the perfect package for the serious collector who wishes to acquire a classic vintage Omega Seamaster bumper for investment. Near mint throughout, complete with its vintage Omega buckle, box and paperwork from a Manchester UK jeweller.